Crafting Stupendous View Aesthetically With Best In Class & Resistant UPVC Win-Doors! All-Inclusive UPVC Win-Doors Services Brought To You By Progressive! We bring comprehensive UPVC Win-Doors services that will enhance the grandeur of your home or office and insulate you from dust, rain and pollution. Take a quick look at our products! Our sliding Windows are featured with two tracks and two panel (Or more) horizontal sashes fitted with quality rollers for swift sideways movement from left to right track. The sides are bit heightened so that dust can be prevented from settling in the track. 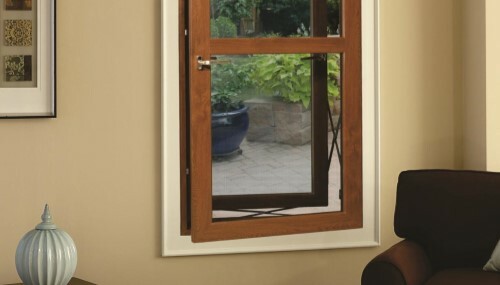 We also offer a combination of Fixed and Slider Windows attached with a Coupler. • Sashes to cover larger spans. Designing and fabricating casement windows which come in miscellaneous designs covering top hung and side hung is our forte. 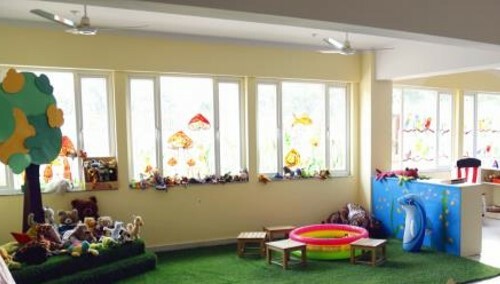 This category has been an immensely popular choice of our clients for last several years. It is featured with a sash which is hinged from the side on an outer frame and it can be opened both inwards and outwards or left to right. • Double sealing for preventing pollution, dust, noise. Our Parallel Windows are designed for maximum ventilation and ideal for staircases, landings and offices. With a maximum sash size of 2 metres (6.6 feet) wide and 2 metres (6.6 feet) tall it caters for large openings, giving plenty of light to the area. With a weight carrying capacity of 200kg per sash the glazing options are almost limitless. There is a facility to incorporate a security grill or blinds for security or privacy. • Can be inward or outward opening. • Glazing options from 4 mm single to 36mm triple. • Integrated solution for security grill. • 3 frame options to choose from. Adorned with enthralling features such as versatility and next generation design, tilt & turn windows offer more than comfortable living. Our tilt and turn windows come with a sash which can be tilted at an angle from the top. The tilt is chiefly for ventilation. • State of the art design. We have also been fabricating windows as per our customers’ requirements no matter what the shape and size is. Available in multifarious styles and sizes, our special UPVC windows will definitely add an aesthetic value to your home/office. • Unique and beautiful designs. • Hexagonal, circular, duct cover windows or anything. Our Fold N Slide Windows system offers superior operating performance and smooth integration into any architectural style and space. The window system is engineered to using multiple looking and with 2 to 6 panels the system offers unobstructed opening options. The hardware used offers a smooth glide and reliable performance with solid design and engineering. • Dedicated top guide and bottom track to ensure perfect alignment . • Internal glazing option from 4 mm single to 36 mm double. • 2, 3, 4, 5 and 6 pane option. • Can be opening in or out. Our Vertical Slider Windows, a traditional fenestration concept that has become the perfect solution for ancillary frames when the opening aperture is taller than width i.e. reference golden ratio 1: 1.618, and when one opening sash is required for ventilation and/or fire escape! Its simple operation is based on a pair of frame specific, site tensioned, spiral balances that can hold the sash open in any position. • Contemporary modern Softline appearance. • 10 mm sash overlap for enhanced performance . • Internal glazing option from 4 mm single to 22 mm double. • Special spiral balances made to suit sash weight and frame size. • Opening sash secured with espagnolette locking device. Our TwinSash Windows are designed to provide ultimate flexibility for fabricators and clients alike. 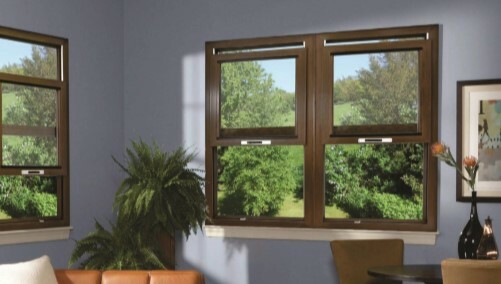 It provides the option of combining the traditional casement window with traditional inward opening fly screen option. There is a facility to incorporate a security grill or blinds for security or privacy. 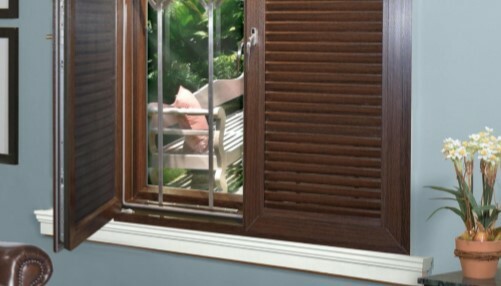 It also offers an additional variant of sash with integrated louvers with fly screen option. • Contemporary modern soft line profile appearance. • Design compatibility with the EN casement and sliding range. • 10 mm sash overlap for enhanced performance. • Integrated solution for security grill and fly screens. • Secure hardware fitting into steel reinforcements as standard . Our Tilt N Slide Doors offer the ultimate in protection for your home. The European concept of tilting and sliding the door sash allows the provision of a dual compression seal and provides the maximum ventilation and glass area. The dual compression seal gives excellent insulation from sound and dust alike. • Double Compression seals protect against draught, dust & water . • Internal glazing options from 4 mm single to 36 mm triple. Our Fold N Slide Doors system provides superior operating performance and smooth integration into any architectural style and space. The door system is engineered using high quality uPVC Window and Door profiles and superior hinge and locking systems that are reliable and secure. The rollers along which the doors slide, offer a smooth glide and reliable performance with solid design and expert engineering. • 9 mm sash overlap for enhanced performance. • Heavy duty tandem rollers for smooth operation. • Secure hardware fitting into steel reinforcements as standard. Our the leading fenestration brand in the country, has given innovative fillip to traditional sliding and the result is – Lift n Slide Doors which are designed for larger openings for unobstructed views. By rotating the handle 180° the door fully lifts off its seals. Our hallmark engineering precision ensures ease of function in both operations, that is, sliding and lifting. • Easy handling due to perfectly aligned system technology. • Double compression seals protect against draught, dust & water. Modern frame apertures are getting bigger and the demand for more glass and less vertical divisions by frame members is also increasing. Our Heavy Duty Patio Doors can comply with those new challenges with its 2- pane version which can be manufactured up to 5.8 meters wide and up to 3.0 meters tall, accepting a maximum sash weight of 300 kg. The overall outer frame depth of 142 mm housing two 62 mm deep sashes is perfectly suited for modern straight through apertures..
• Unique Aluminium low threshold option for 2-track, 3-track and 4-track . • Heavy-duty tandem roller and multi-point lock as standard. • Aluminium interlock for addedrigidity equipped with double seal. • Optional mosquito screen and/or centre-pane/4-panel adapter. Our French Doors, also known as double doors or double windows, are a pair of glass doors usually opening from the back of a house into its garden or onto its balcony. This concept of opening both sashes fully without seeing a centre obstruction has influenced French architecture since the 17th century. The whole grace and dignity of many European buildings was based on this majestic design principle. • Our casement sashes are suitable for French doors and French windows. • Choice of numerous multi-point locking devices including full perimeter locking. 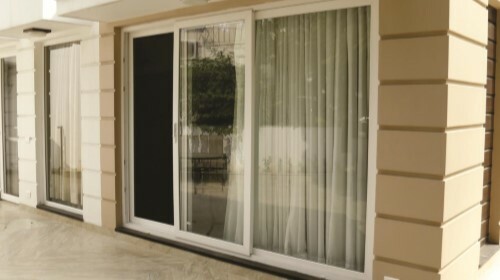 • French doors are available threshold-less or with Aluminium low threshold. • Choice of hinge types including concealed (invisible) hinges. Our TwinSash Doors are probably the most ingenious door invented in India comprising two independently operated door sashes, one sash opening-out for mosquito screen and one sash opening-in for glazing. However, some parts of India may only require one sash equipped with mosquito screen whilst the second sash houses fixed or adjustable louvres. TwinSash doors can utilise our two dedicated, door sashes and wide range of locking devices. 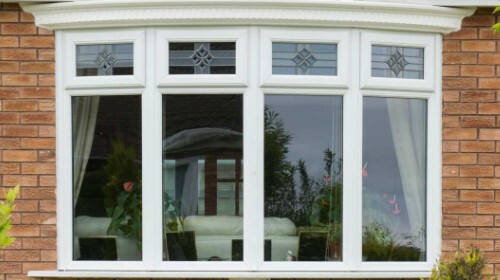 • 152 mm outer frame depth with 56 mm available space between sashes. • Possibility to combine mosquito screen, panel, louvres and glass within one unit. • Choice of locking devices and hinge types including concealed (invisible) hinges. 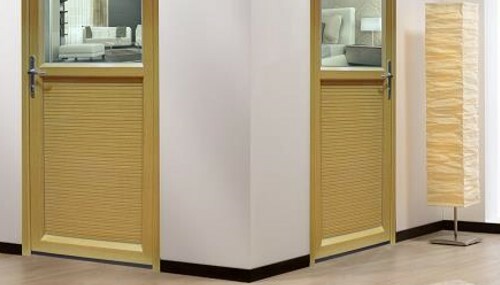 Our Sliding Doors range covering frame depths from 62mm to 142mm is designed to provide the maximum flexibility for fabricators and clients alike. Based on a range of sections, it offers full flexibility from single sliding to multiple sliding openers, clip on or integrated sections for fly screen and a range of section sizes covering small and large openings. • One, two and three track sliding, Patio door and fly screen options. • Internal glazing options from 4 mm single to 22 mm double. • Choice of single or multi – point locking devices. • Hardware components fastened into steel or walls or uPVC. 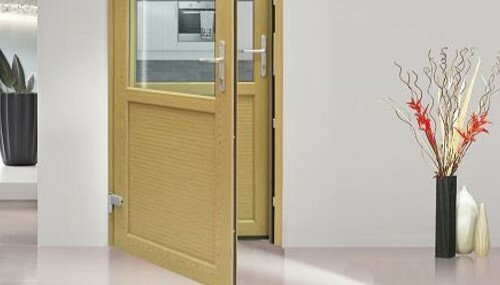 Our Single or Double Casement Doors, suitable for opening-in and opening-out mode, can be used as main entrance door or as ancillary door leading onto corridors, Patios or balconies. Casement doors are available in 62 mm or 112 mm profile depth, can be manufactured as stand-alone items or part of a screen incorporating fan lights and/or side lights. 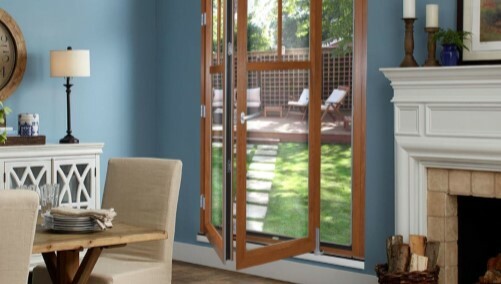 Double doors also known as French doors can be used as an alternative to sliding Patio doors, especially, when a clear wide opening is being desired. • Threshold-less or Aluminium low threshold. 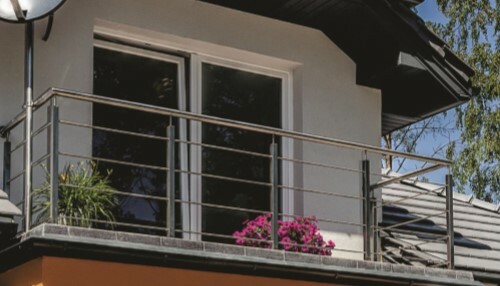 Our Balcony Doors are intended to provide more glass area due to an overall, slimmer frame sight line and are available as either single or double doors (French doors), opening-in or opening-out, and are offered with one operating handle by design which is positioned inside. 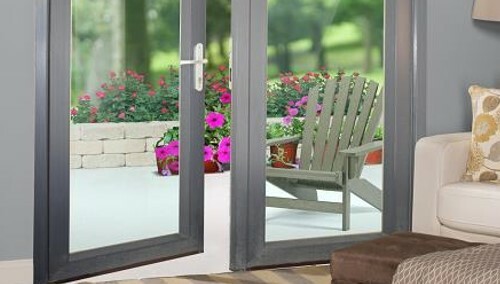 A special handle and a concealed snap-in device enables a temporary closing of the door when outside. 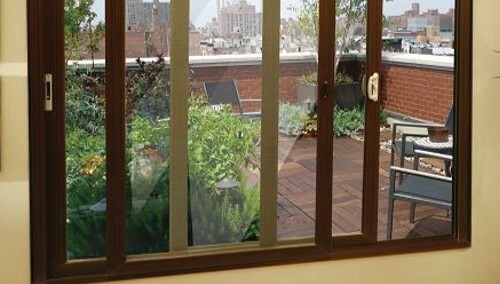 Balcony doors can be standalone items or manufactured with fan lights and/or side lights or integrated into complete curtain walling screens. • 9 mm sash overlap for enhanced performance . • Threshold-less or Aluminium low threshold . High performance in terms of air and water tightness, dust, insects, sound reduction requires sealing of the full sash perimeter. Any low threshold or thresholdless arrangement will compromise the performance aim but traditional living habits combined with ergonomics are today's overriding factors for fenestration. 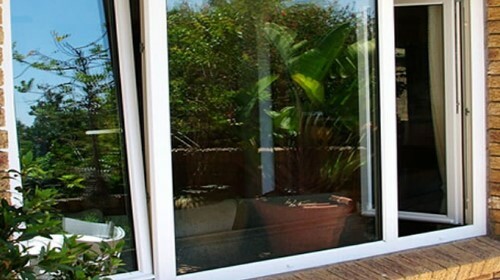 We are offering, wherever possible, Aluminum low threshold solutions or provide suggestions on how to prepare ground levels to hide the unwanted, high frame upstand associated with Fold & Slide Patio Doors and Tilt & Slide Patio Doors. We have chosen purposely Aluminum thresholds with silver anodised finish to provide a hard-wearing foundation for years of product durability.